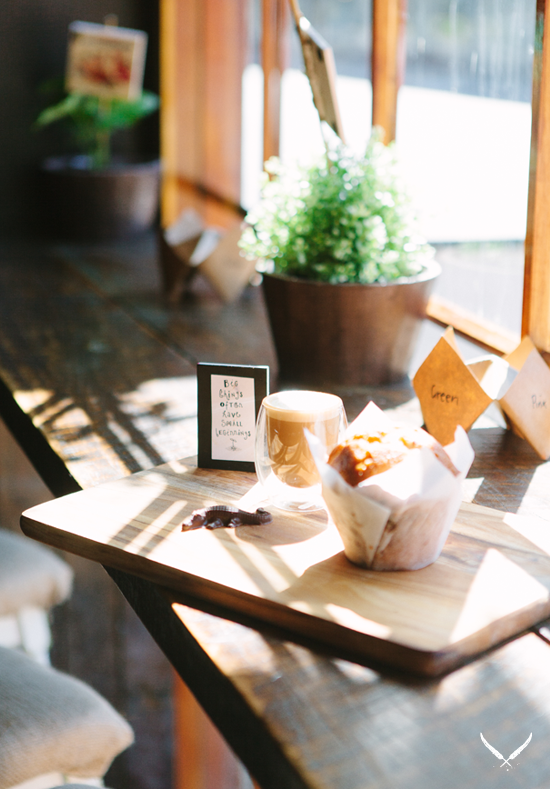 It would be easy to stroll right past the timber framed shop front of new Ann Street cafe, Lost Boys, and let me tell you, you'd be pretty upset if you did because this rising star in the Brisbane café scene is serving up really delicious food and great coffee! From the outside new Brisbane cafe Lost Boys looks like your regular café, but step inside and you're transported far away from the hustle and bustle of busy Fortitude Valley. Large tree trunks sprout up from the floors, shooting straight up toward the ceiling, their branches and leaves creating a green canopy over the cafe ceiling. You guys, there's even a rope bridge! Different coloured bottles with rope cords hang from the jungle canopy, complete with hanging vines and moss. 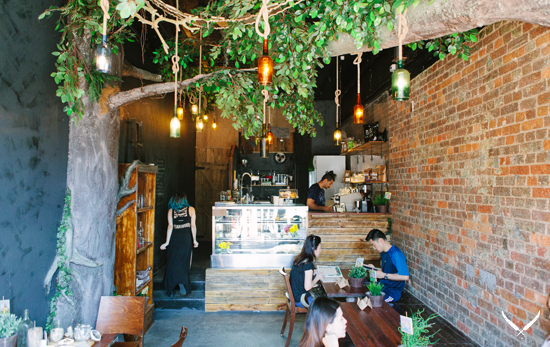 The old exposed brick wall on the right wall of the cafe is set off against a dark interior, making this new Brisbane cafe a jungle retreat straight out of the Peter Pan storybooks. Speaking of storybooks, the menus have been stuck to the inside pages of vintage hard-cover children's books and make for a really fun way of deciding what to eat. Okay, so it's got a great interior, a really cool menu and a dope Peter Pan theme, but what about the food and drink? Well, get ready to put your Wendy where your mouth is because it's about to get real delicious up in here. The cafe is completely vegetarian, and the Lost Boys crew make as much as it can in-house and strive to use locally sourced ingredients—they've managed to create a menu with enough choices to suit just about anyone. The breakfast menu is short, sweet and tasty. If you're after something light, there's toasted wheat free muesli served with natural Barambah yogurt and sprinkled with blueberries, toasted coconut, pepitas, and honey, all served in a lovely little jar. For those after a real breakfast chow-down there's organic free range poached eggs (nice and gooey in the middle) served with sourdough, avocado, parmesan cheese, rocket, pine nuts, and home made aioli. 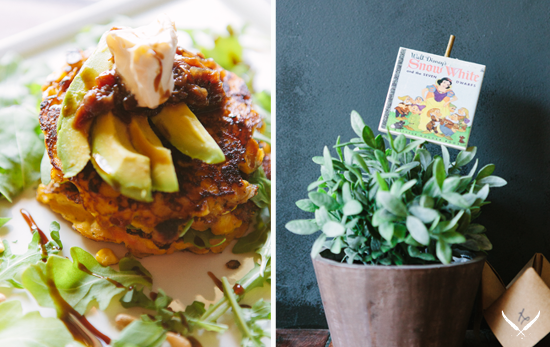 If you're in the mood for a real treat, try the absolutely delicious corn fritter stack topped with home made caramelised onion relish, Barambah sour cream, avocado, balsamic glaze, and pine nuts. It's the perfect mix of sweet, fresh, and a little touch of sour. I could just about drink that balsamic glaze, it's so good! Losties keep it local by using Montville coffee, which tastes fantastic, and serve their drinks on a wooden board with a super cool and super tasty chocolate crocodile. There are other drink options on the menu like iced coconut coffee and iced coconut chocolate, as well as an iced blueberry and pomegranate tea infused with cold pressed green apples, perfect for those hot summer mornings. It's exciting to see a Brisbane café doing something new with drink options outside of the usual tea and coffee selection. The cafe also has a killer lunch menu including salad of the day, beetroot bruschetta, Neverland Nachos, veggie burger, and create-your-own pizzas. If you want to pop in for a drink and a snack, the team put together an amazing tapas platter and chips and dips to share. Lost Boys will be expanding soon, spreading out to the back of the building into the currently developing Bakery Lane. This will also see the cafe extend its trading hours to evenings and turning into a really cool bar when the sun goes down, serving organic beer, cider and wine to go with their already fantastic menu. The cool thing about new Brisbane café Lost Boys is that even with its carbon-neutral, organic, vegetarian, natural approach, it's still so inviting, welcoming and suited to everyone, not just those who already have an organic or vegetarian lifestyle, so get on down and check out one of Brisbane's up and coming cafe heroes!